What is the first responsibility of a Secretary of Defense? Malcolm P. Stag III, Secretary of Fear, commented at a breakfast meeting today: "I spoke to Sec. Gates on the way to the office. Gates is first-rate defense secretary. The man understands the first job of a defense secretary." Sec. Stag pointed to a copy of The Hill, a political newspaper, and asked Easton Syme, a senior DoF defense industry liaison, to read aloud from an article. 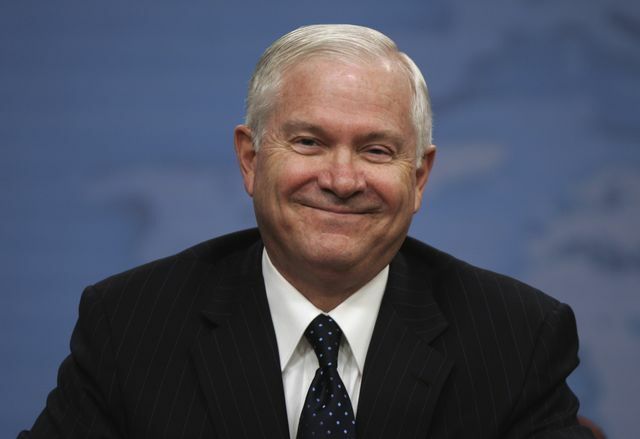 "Defense Secretary Robert Gates took a swipe on Tuesday at the proposal from the co-chairmen of President Obama's deficit commission to slash the Pentagon budget by $100 billion. "Starting at an early age, American children learn what they have to fear: terrorism, drugs, the social activists, and the illegal immigrants. The Four Fears. Many young American children want to grow up to become heroic warriors. The youth of America yearn to prove themselves on the global battlefield. "It's not for lack of fear that Americans become great, it's fear that makes courage and heroism possible. Reduce the defense budget and you deprive tomorrow's heroes access to the battlefield." "But I digress. We, the staff of the Department of Fear, working with our colleagues in other agencies -- defense, Homeland, TSA, ICE, and the CIA -- carry a great burden. Yes, we have to defend America. But to do our job well we first have defend our budgets. That means helping the American People to prioritize fear." FearSec Stag took a sip of orange juice and said, "The Department of Defense is under attack. Secretary Gates needs our help. We will be there for him." Everyone who had been seated at the breakfast table stood up and cheered.